These return favorites, record-breakers, new releases, top-shelf treasures have one thing in common – they're the most talked-about wines on the site. Now's your chance to take home Camille's Napa Valley Cab, Stephen's refreshing Pinot Grigio, elegant Pinot from Scott, and SO much more! And no drop would be possible without you – that's why you're getting this scrumptious case for $134 off the list price. Ben’s a major player in France’s 2,000-year-old wine history. Thanks to your funding, he's able to work with some of the oldest vines in Languedoc– a region that’s made wine since the days of Ancient Rome. Your Angel-funded winemaker says: "I enjoy making my mark within all of that history and tradition. Wine is more than product here– it's culture." It's also decadent, luxurious... and your top-rated French-made wine to-date. This special 6-pack features his masterful Grenache and Syrah blend, refreshing and unique Picpoul, and much more... for a price that will make you say ooh la la. To be honest, we're just as obsessed with South African wines as we are with the iconic 80s hair bands like Toto. And THAT's saying something. You'll love Carmen's and Stephen's bright, vibrant, and extra-ripe wines - thanks to loads of gorgeous sun, these rockstar wines are incredibly juicy and food-friendly. We've packed 6 into this special pack with a smashing savings. Hurry, boy... it's waiting there for you! You fund refined Bordeaux and rare Picpoul straight from the source! Why worry about finding Bordeaux-style blends or French-style whites when you can have the real thing – and save loads while you're at it? Includes Jonathan's wondrous Bordeaux, Benjamin's silky red blend, luxurious bubbles from Jean Philippe, and a classic Sauvignon Blanc more loveable than Amélie. Normally you'd pay beaucoup bucks for world-famous wines like these... but you fund Jonathan, Ben, Jean Philippe, and Patrice directly – that's why these exclusives are yours for a steal! Your Wine Advisors know EVERY wine you fund...and they know them well. This case is packed with everything they're currently obsessing over. From sumptuous reds like Matt's Napa Cabernet to elegant whites like Ondine and Daryl's refreshing Sauv Blanc, you’ll go crazy for these wines – we sure do. This is 12 bottles of wine for an unbelievable deal. Grab the season's must-haves while they last! Not too expensive, not too cheap. These wines are priced juuuust right! 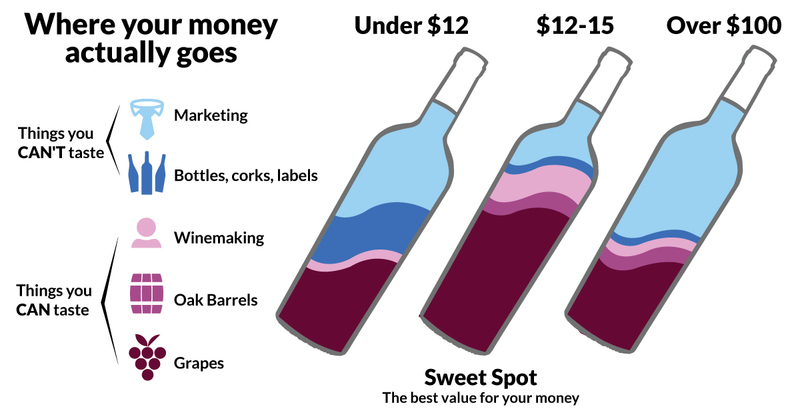 When it comes to wine, a small step in price = a HUGE leap in quality and taste. These mind-blowing wines are the ultimate example of where your dollar goes a very long (and delicious) way. This case includes seriously smooth reds and delightful whites that prove there's a perfect price for a bottle of wine.